When a friend and I went wine hopping a few weekends ago, I never expected to learn about politics. 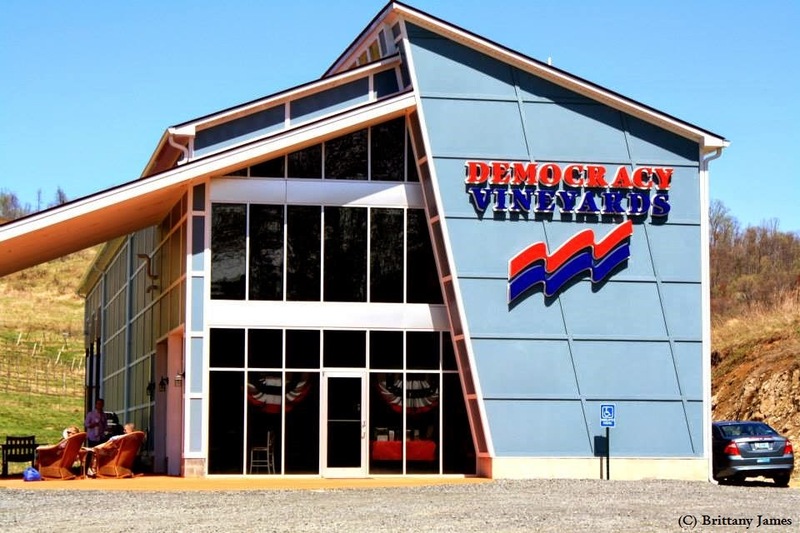 But at Democracy Vineyards in Lovingston, Virginia, we toasted the principles of democracy over a refreshing glass of Petit Manseng and under the stirring slogans of dozens of political memorabilia. Before you even discover Democracy's tasting room, however, the vine-blanketed hills of the vineyard greet you. We actually stopped the car in the middle of the road in order to fully appreciate the bucolic scenery before continuing down the hill. There the contemporary architecture of the tasting room building stands in bold contrast with the rustic feel of the vineyard; we found the juxtaposition to be full of attitude. Red, white, and blue are the dominating accents of the tasting room's interior. Owners Susan Prokop and Jim Turpin have taken the democracy theme to an eclectic level by decorating the walls with a collection of historic political memorabilia, ranging from American campaign posters to a quilt made from political t-shirts from all over the world and from banners celebrating the success of the Velvet Revolution to campaign posters touting slogans of a German political party. While most of the memorabilia seems to favor the left-side of politics, none of the displayed collectibles date more recently than thirty or forty years, so our right-wing compatriots won't feel too uncomfortable here. But let's get to the wine! We had to wait nearly ten minutes after arrival before we were able to begin tasting the wine; five people were already cozied up to the tasting bar, leaving no space available for us. But once seats opened up, we had the undivided attention of the tasting room attendant, and we sampled the full-line up of Democracy's wines, from Merlot to Chambourcin. Like the interior decoration, the names of the wine also follow a democratic theme, from Emancipation to Constitution. And once again, the Velvet Revolution made an appearance in the form of a dry red blend; the Velvet Revolution was the peaceful overthrow of the communist party in Czech Republic (then known as Czechoslovakia), and owner Susan Prokop feels a close affinity with the event due to her family's Czech heritage. We finally settled upon our favorites - the Declaration, a dry white blend of Chardonnay, Viognier, and Petit Manseng, for Brittany, and the Republic, a 100% Petit Manseng, for me - and deposited ourselves into some of the most comfortable patio furniture this side of the Mississippi while surveying Democracy's tidy rows of vines. 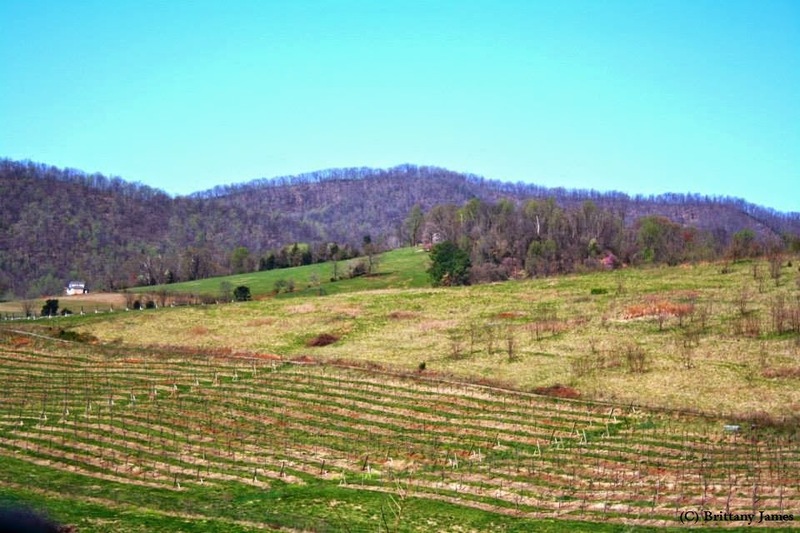 It was another enjoyable visit to a great Virginia winery. Part of the #252by2022 challenge. The first two photos are the property of Brittany James and are used with permission. Unauthorized use of these photos is strictly prohibited. What a fun theme for a winery! Definitely makes it more memorable. Sounds like you had a fun trip!